GA: The Lodge looks great, tell us about the changes and what’s new? Eric: We essentially took the existing structure and started from scratch with a $3 Million Dollar full renovation. The building, totaling 35,000 square feet, now includes 17 Class A office condominiums upstairs and the downstairs includes conference facilities, a new Salon & Spa and the new Pro Shop & Locker Rooms for the Cramer Mountain Club. GA: Tell us about the customizable office space you have available- how does that work? Eric: Of the 17 suites, we had enormous success with our initial sales. Currently, we have one fully finished suite ready for occupancy as well as one suite that can be fully customized to the owners liking. The suites are very unique in their appearance and high end finishes and offer dramatic views of the Club and property. High end technology driven conference facilities are also available at no cost to owners within the Lodge. In addition, owners also receive a Full Golf membership with their purchase of an office condo. It’s a one of a kind environment unique to both the Charlotte and Gaston County area where office owners can enjoy a high end office environment while escaping the typical office environment. Current owners include Financial Planning, Technology, Investment Firm, Development Firm, Physician and general office. GA: So you now have a spa section? allows proven, successful operators to essentially own and operate their own business within the Lodge. The salon owners and their client are extremely happy with the luxurious environment. We will begin taking reservations for qualified stylists and operators for Phase II in February. Phase II should be complete by Summer of this year. Anyone interested can contact Ryan Drye at ryan@lenoxdevelopment.com. 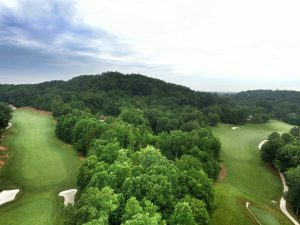 GA: What does Cramer Mountain offer in the way of golf? 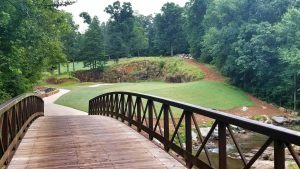 Joe: Cramer Mountain Club is a hidden gem, just 14 miles from Charlotte. 18 Championship golf holes that offer extreme elevation changes and a truly unique design. The topography and shot making required makes our course one of a kind. You truly feel like you playing in the mountains and away from the stress of city life. GA: it’s a little cold right now, but what about tennis and pool amenities? Joe: Our social facilities are a fantastic club amenity that were designed with families and children in mind. We boast a brand new zero entry 132,000 gallon swimming pool with splash pad and 15ft water slide. Combine this with four har-tru clay courts a playground and multi-use sports court, there is an activity for everyone. One can grab a bite to eat or cold drink from our family friendly restaurant whilst overlooking the whole social facility. Joe: We offer four types of membership at unbeatable prices. All membership include the whole family. GA: What is the best thing about Cramer Mountain? Eric: The location and atmosphere. You essentially have a high end luxury mountain environment less than 30 minutes from downtown Charlotte and 15 minutes from the Airport. Regarding the Lodge, there is nothing close to the amenities and quality of the office environment to buyers interested in the benefits of owning, rather than leasing an office space. GA: What is one thing that folks would be surprised to know about Cramer Mountain? Eric: The quality and affordability offered in such a unique environment. With the $10 million in overall renovations to the mountain environment, The Lodge and Cramer Mountain Club are unmatched in value. For more information log onto cramermountainclub.com or call 704-879-4888.